Rail, River, Hudson -- July 11. Tickets are limited. 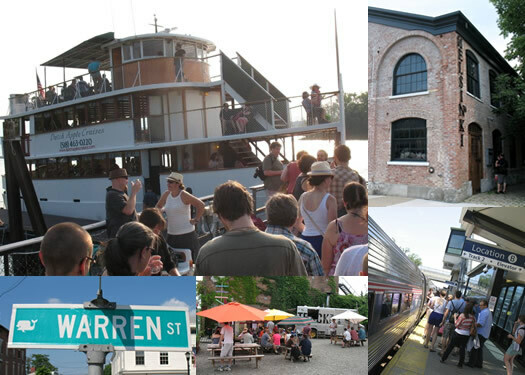 We're a little more than two weeks away from the All Over Albany Rail, River, Hudson II adventure, and plans for a great day are shaping up nicely. If you've been meaning to get your tickets, now would be a good time. Last year's event sold out, and space for this year's trip is limited. In addition to the Amtrak trip, Dutch Apple sunset cruise, cocktail party at Helsinki Hudson, and other fun surprises, Sweet Sue's of Troy will be catering the trip home. Oh, and homemade strawberry shortcake. The price for the entire day -- round trip tickets, tastings, party, and dinner -- is just $65 per ticket, thanks to our sponsors. You'll find them listed below. Need more incentive? Here's a look at last year's trip.